In retrospect, Clif and I could see it had been coming on for months, since spring, at least, and maybe even longer. Our dog Liam just wasn’t himself. After the morning walk, Clif would bring Liam to our fenced-in backyard, where he would take up his favorite spot by the gate. 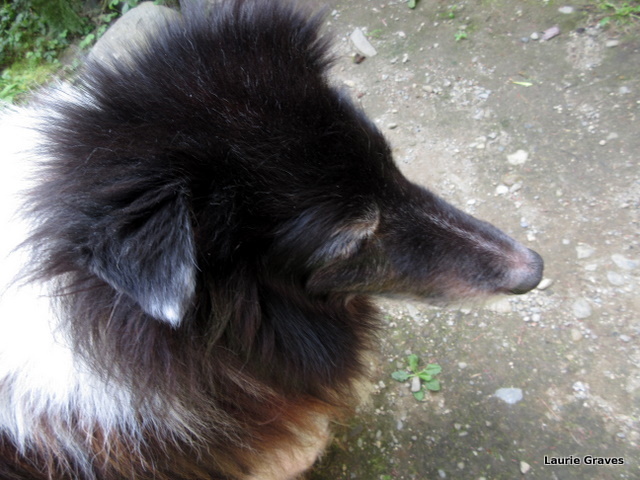 Liam is a Sheltie, and ever since he was a young dog, he knew it was his job to guard the house and us, his herd. From his vantage point by the gate, Liam could keep track of dogs and people going up and down the road, and he was diligent about alerting us when he spotted anything. Our cellar opens into the backyard, and as soon as the weather is warm enough, say, in late spring, we leave the door open so that Liam can come in and go out as he pleases. After all, along with guarding the house, a dog has to take some time off to beg for treats during lunch. Except Liam wasn’t coming upstairs for lunch to get his usual treats. Instead, he stayed outside all day, coming in only at twilight. “Maybe he’s got a little doggy senility setting in,” Clif said. “Maybe,” I replied, and we both felt uneasy. Then Liam started having a hard time going down the cellar stairs at night for his evening visit to the backyard. “Maybe he’s got a bit of arthritis setting in,” I said. One day when we were on the patio, we handed Liam a bit of something we were eating—a peanut, a crust of pizza, some chicken—I don’t remember exactly what it was. What I do remember is that Liam didn’t take it, that he just stared straight ahead. Only when we touched his nose with the treat did Liam realize it was there. Then we knew. Liam was going blind. We did our own simple test to confirm this—we waved our hands in front of his face, and there was little reaction. This was the beginning of July, when he could still go up and down the cellar stairs, albeit slowly. By mid-July, it was clear the stairs were too much for him. One night, he fell down the entire flight, and I felt such grief that if I had had three wishes, one of them would have been used to restore Liam’s sight so that he could go back to being the nimble, alert dog he had been just six months ago. We took Liam to Dr. Bryant, our veterinarian, to find out if anything could be done. Unfortunately, there wasn’t. After examining Liam, Dr. Bryant concluded Liam had sclerosis of both corneas, and there was no surgery that could restore his vision. Not a problem for us. Unless something new comes in or something old goes out, our rooms stay the way they are. Liam has adapted, but he went through what can only be called a doggy depression. He lost weight. He slept a lot. He seemed to fold into himself, spending most of his days inside rather than outside. There was no more sitting by the gate to guard the house. In a month’s time, it seemed as though he had aged a year, maybe even two. And so it goes. Our sadness has mellowed to resignation, and we do what we can to help our buddy. It is clear Liam will never be the dog he used to be. How could he? For any dog, losing sight would be a terrible loss. For Shelties, who are so incredibly visual, it is even more of a loss. However, recently I have noticed that every once in awhile, when Liam is in the yard, he stands still and listens. Yes, he hears someone coming down the road—a person, a dog, maybe both. And Liam barks to let us know. Breaks my heart – poor Li-li!! Glad that he’s starting to adjust/cope some. Give him extra kisses and treats for me!! Sorry to hear this, Laurie. It sounds like you guys are doing the best you can and that he is adjusting, but I imagine that it’s still hard. You take care. Understanding your grief………I once had a Welsh Terrier who lost her sight rather young……..it really did little to limit her zest for life……..just had to be very careful when she walked or ran with confidence……..your writing here is again so sensitive and expressive. Liam is a lucky dog. Thanks, Jim. So glad your Welsh Terrier maintained her zest for life. Liam hasn’t adjusted as well. Perhaps because of his age. I am so sorry to hear this about Liam. I am a little choked up because I know what it is to love a Sheltie and be aware of their health problems. We lost ours at 15 1/2 and I thought I would never be happy again. My brain told me I would but my heart wasn’t so sure. I am of course. We can hope and pray that Liam is adjusting and will be healthy other than that for a long time. They are such happy cheerful dogs and as he adjusts I bet some of that will come back. Oh, thanks so much Judy! Your comment brought tears to my eyes. Oh, me too, Judy – Lovely reply. Thanks, Derrick. Poor old dog buddy! Such good advice, Johanna! Thanks so much! Yes, our dog buddies deserve all the attention they get. How we love them. Truly, they become members of the family. Oh, thanks so much! We have begun following your advice and are taking Liam for a series of short walks. Does Liam like the walks? You know there are also all kind of toys that you can put little treats in or work with sounds, like squeaks and bell toys. They can bring some new adventure in Liam life too and train him to do more on scent and hearing and less on sight. I am really happy for Liam, he has the best friends in the world!!!! He does like his walks, as long as they are short. We’ll have to see about getting him a special little treat toy. Again, thanks so much for the advice. Thanks, Johanna. We are already settling into a routine. Lovely reply, Johanna – It sounds like very good advice. Poor Liam. He is fortunate to have you. Thanks, Jason. He’s such a good buddy. Laurie, your love and caring is a gift – to Liam and to all of us. Big hugs to you, sweetie. Oh Laurie, my heart goes out to you, Clif, and Liam. Having been through Zoe’s decline so recently, I know how incredibly difficult it is to watch a beloved dog struggle. Johanna’s advice sounds promising. I know that Zoe appreciated our love to the very end. And Liam doesn’t need his sight to know how much you care for him. Hang in there. Thanks so much, Brenda. We are all adjusting. Dogs are stoic and uncomplaining, it is easy to miss subtle signs. It is a tribute to Liam that he is still guarding the home for you in the best way he can. Dogs hold a special place in our hearts. So sorry for you and for Liam.